Description: This realistic McDonald's® countertop refreshment center serves pretend milk shakes, cold drinks and ice cream. The refreshment center was sold with lots of accessories including realistic McDonald's cups, icecream sunday cups, icecream cones, molded pretend icecream, and more! The set was also sold with little ice cubes that can be dispensed from the refreshment counter. The ice cubes are the most hard to find pieces in this set. All accessories store neatly on the base. Designed for children ages 3 to 7 years old. FPT7029 - McDonald's® Soda Fountain Base - White countertop refreshment center with a blue base. 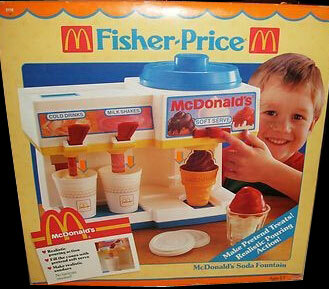 The front of the base has 2 red pull-down drink dispenser levers and a large red sliding ice cream dispenser button. The lithograph above the two drink dispenser levers is marked "Cold Drinks" and "Milk Shakes". When the Cold Drinks lever is pulled down an orange plastic molded stream of "liquid" lowers and appears to pour. When the Milk Shakes" lever is pulled down a pink plastic molded stream of "liquid" lowers and appears to pour. The lithograph above the ice cream dispenser has a picture of 3 icecreams and is marked "McDonald's®" and "Soft Serve". The area on top the two drink dispenser levers has a blue rectangular drop-down flap marked "ICE" to drop the FPT7040 icecubes into cups below the "Cold Drinks" lever. The top also has a raised round area marked "CUPS" to stack the FPT7037 cups onto and a recessed rounded area to place the FPT7038 cup lids into. The top area above the "Soft Serve" button has a round yellow wheel with four holes to place the FPT7032 and FPT7033 icecream swirls into. When the Soft Serve button is move, the yellow wheel spins and drops an icecream swirl below. FPT7030 - Large round blue lid with a raised round handle on top. 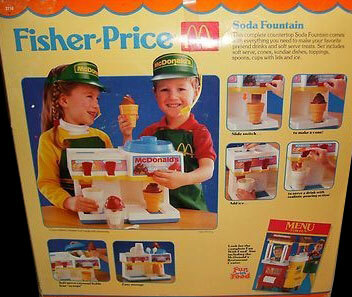 The lid fits over the ice cream section on the FPT7029 McDonald's® Soda Fountain base. Top of the lid is marked, "Fisher-Price" and has 3 heart with leaf designs. 2 each - FPT7031 - Tan ice cream cone with a flat bottom and criss-cross designs on the sides. 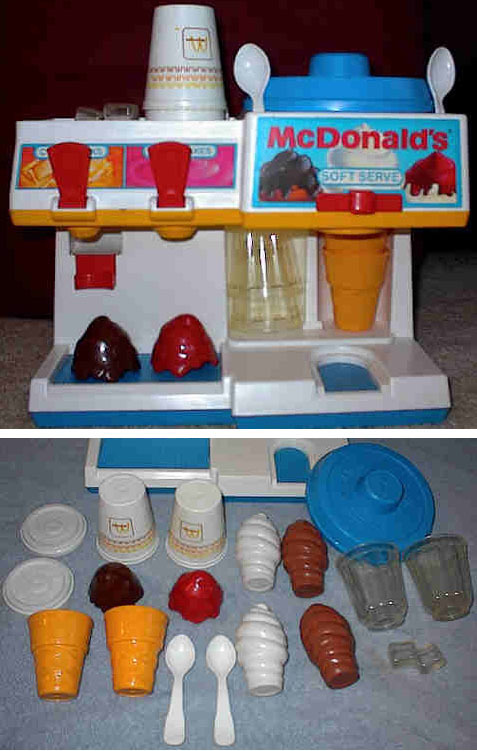 The cones is marked "McDonald's" on the top sides. Marked "©'88 F-P" on the bottom. Measures 2-13/16" tall, 1-1/4" base diameter, 2-1/4" top diameter. 2 each - FPT7032 - Brown (chocolate) plastic swirled ice cream with a swirled top and a long swirled bottom. This icecream fits into a FPT7031 icecream cone or a FPT7036 ice cream sunday glass. The icecream has a mold seam across the middle and is marked "©'88 F-P" on the bottom side. Measures 3-1/2" tall. 2 each - FPT7033 - White (vanilla) plastic swirled ice cream with a swirled top and a long swirled bottom. This icecream fits into a FPT7031 icecream cone or a FPT7036 ice cream sunday glass. The icecream has a mold seam across the middle and is marked "©'88 F-P" on the bottom side. Measures 3-1/2" tall. FPT7034 - Dark brown plastic chocolate syrup ice cream topping. This is hollow and shaped like hot chocolate on top of a McDonald's® Hot Fudge Sunday. FPT7035 - Red plastic strawberry syrup ice cream topping. This is hollow and shaped like strawberry on top of a McDonald's® Hot Fudge Sunday. 2 each - FPT7036 - Clear plastic ice cream sundae glass with rounded scalloped sides. This glass looks just like the icecream sunday glass (container) used in a real McDonald's® restaurant. 2 each - FPT7037 - White hard plastic McDonald's® cup that look just like Happy Meal size cup used in real McDonald's restaurant. The top sides of the cup has 3 horizontal rings (yellow, orange, and brown) of golden arch "M" shapes. The front of the cup has a yellow "M" and brown "McDonald's" inside a brown square. 2 each - FPT7038 - Round white McDonald's cup lid that fits on the FPT7037 McDonald's® cup. The top of the lid has a raised "Fisher-Price" imprint in a half-circle. The top of the lid also has a raised heart with "leaves" imprint design. The center of the lid top has a raised round circle. 2 each - FPT7039 - White spoons with an imprint of a heart shape and 4 "leaves" below it on the end of the handle. The end of the handle is round. 2 each - FPT7040 - Clear plastic "crushed" ice cube. Measures 15/16" long, 3/4" wide, 11/16" high. FPT7041 - This set was sold in a 14-3/4" long, 14-3/4" high, 7-1/4" deep box.